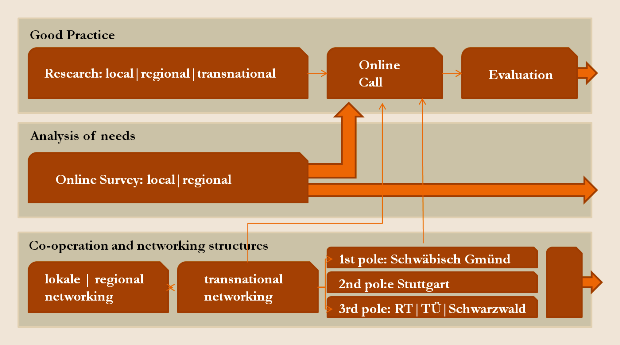 Colletion of the first results of the first phase (second half of 2010) in preparation of the online survey, research, bidding, selection decision, planning and agreements for transfers to a combined all-in-one document. In the main phase during the years 2011 to 2013, İNPUT project partners and networks will develop and prove measures, taking into account the local needs and the particularity of target groups with a migration background. They will pick up the experiences of good transnational practice and adapt and further develop innovative approaches for a local transfer. 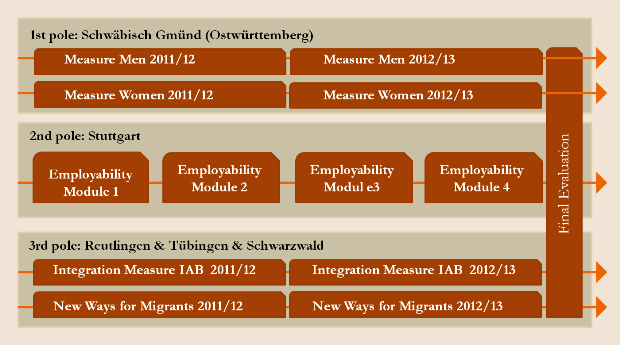 This will happen in the different local areas under the leadership of the local partner organization (BBQ Vocational gGmbH, JuFuN e. V. and Forum der Kulturen Stuttgart e. V. or the selected migrant organisation), in close cooperation with different experts and actors of the selected experiences of good practice and with the active participation of local stakeholders and the project implementing organisations.